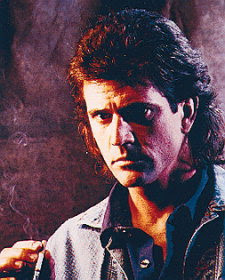 Gibson moved into more mainstream commercial filmmaking with the popular Lethal Weapon series, in which he starred as LAPD Detective Martin Riggs, an emotionally unstable Vietnam veteran with a death wish and a penchant for violence and gunplay. In the films, he was partnered with the elder and more reserved Roger Murtaugh (played by Danny Glover). This series would come to exemplify the action genre's so-called buddy film. The two actors were trained in two different schools of acting. Gibson is classically trained and Glover is a method actor. Three sequels were produced.